When I was browsing Cherry Culture for a NYX Round Lipstick, I was searching for something that is peachy or coral-y shade. Almost all of the shades that I want were out of stock so when I found a coral-pink shade that was not sold out I immediately placed it in my cart. The shade I got is Stella, a girl's name which means star in Latin. This lipstick is very appropriately named with it's vibrant coral-pink color and tiny silver glitters. I'm not a great fan of glitter lips but this one is great because the glitters are not big and chunky so it's not really that noticeable when you wear it. I think that the color is great for the summer and I especially would love it in contrast to my tan skin by that time. I love how rich, creamy and pigmented this lipstick is and I love the packaging too but I also need to point out some cons with them. Just like the lip creams which I find great upon laying my eyes on them, this lipstick doesn't live up to my expectations. This is basically just a hardened lip cream. Much like its lip cream counterpart, it goes on smooth and silky when applied... and I have also found the same faults. It doesn't distribute evenly on the lips, it emphasizes lines and dryness, and it's not long lasting. I think my Wet n Wild Mega Last Lipsticks are even better than this one (and cheaper too). This is another miss for me but I might attribute the product formulation to its fine glitters. It remains to be seen if other NYX Round Lipstick finishes have the same effect and consistency as Stella. NYX also have Black Label Lipstick that I want to try out and compare with the round lipstick since that one is a bit pricey than the Round Lipstick and I hope that one would be better. NYX better reformulate their lipsticks and lip creams because I really love how they market the product but it just doesn't live up to my standards. I still do love most NYX products. 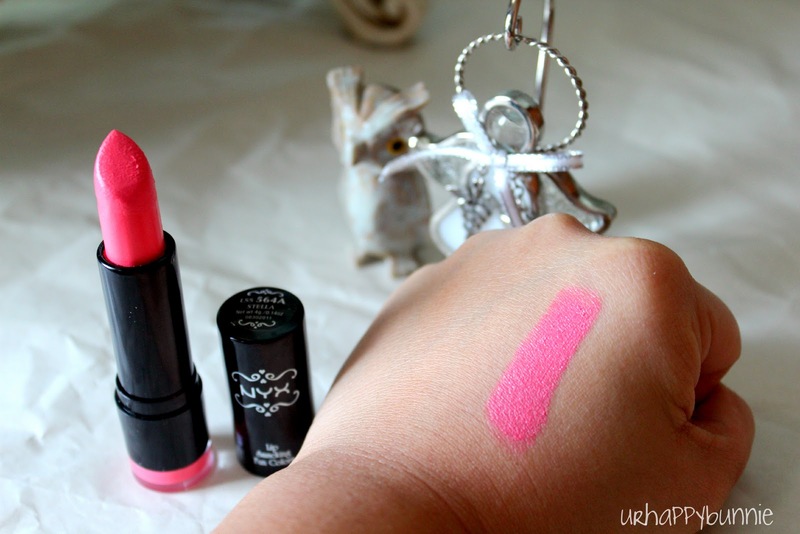 Have you tried NYX Round Lipsticks? What can you say about it? I know most beauty bloggers love the Round Lipsticks so I think I need to give it another chance - maybe their creme finishes rather than the glittery ones? I used to be obsessed with these back then. I actually have a lot in my collection. They are very creamy, but not long lasting at all. It has a pretty colour, what a pity it doesn't live up to expectations. I haven't tried NYX before! I hope NYX goes back to SG again! 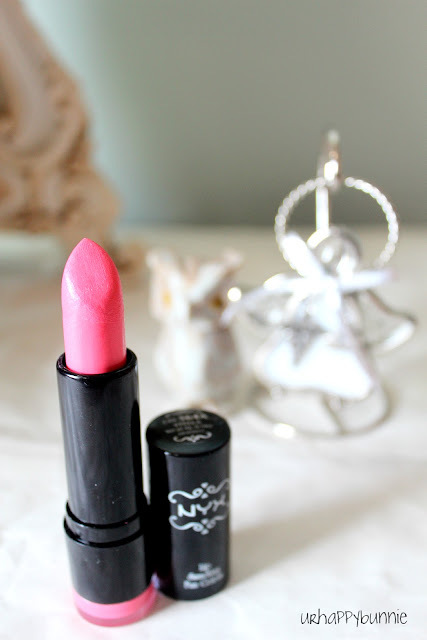 I have a few of the NYX Round Lipstick shades including Paris, Summer Love and Peach Bellini. The only one I have tried so far is Paris and I love it for the most part. The only thing I dislike is that they do not stay on very well. Maybe try a creme formula? I have strawberry milk and it wears pretty well. Wow I'm totally fan of pink color, and these lipstick looks simply perfect! I love it! Nice firma. I find I have the same problem with the round NYX lipsticks they don't last very long and while they have a great range of colors some are hit and miss! yea nyx is either a hit or miss for me too. I like the color and think the packaging is absolutely gorgeous though.